Michael Angelo Batio The MAB Jam Session. Jam with guitar virtuoso Michael Angelo Batio! This DVD includes ten original tracks written by Michael Angelo Batio and Stuart Bull, recorded with Stuart Bull (bass) and Gerry Cunningham (drums) to help you develop your rhythm and lead guitar playing skills at your own pace. Michael plays a guitar solo for each song to inspire you and give you ideas on how to approach each track, then you get a chance to play. Following the riffs and chords is easy using the animated on-screen tablature while scales and mode suggestions appear in real time. 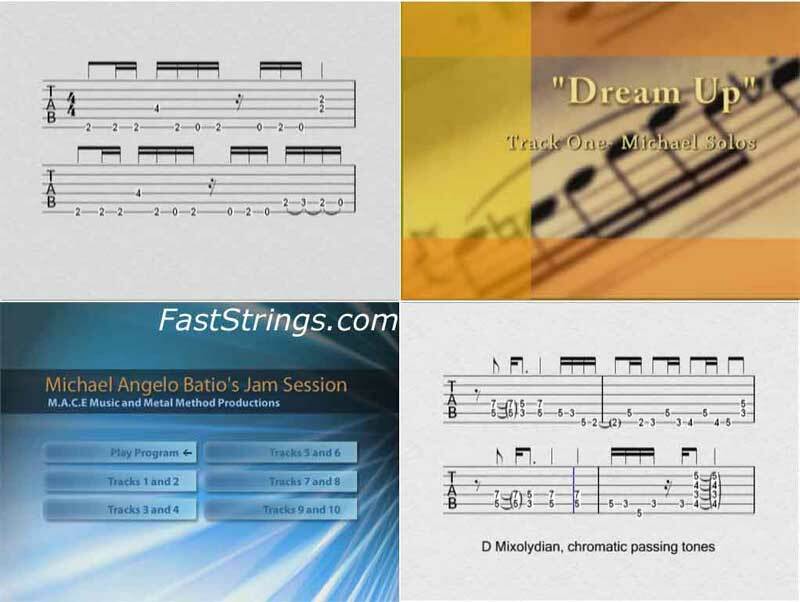 over twenty licks and exercises were written by Michael to help with phrasing ideas and developing your technique. All of the songs and examples include Scorch files for playing along with your computer at adjustable tempos. An easy to follow PDF allows you to print the tab for all the songs and licks. Please note: Michael Angelo Batio does not appear in this DVD but he did perform all the guitar parts. Whether you’re a beginner or advanced, this DVD is an entertaining way to improve your guitar playing skills.